BEIRUT, June 28 (ChinaMil) -- The 16th Chinese peacekeeping multifunctional engineer detachment to Lebanon carried out a combat-readiness drill on June 26 to brace for possible terrorist attacks. 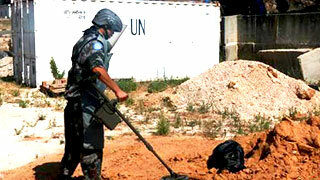 According to a notice from the Headquarters of the United Nations Interim Force in Lebanon (UNIFIL), sporadic crossfire and violent terrorist attacks will be likely to happen under the current situations of more mass gatherings in the UNIFIL mission areas during the Islamic Ramadan as well as the neighboring Syria's complex and volatile situations. The drill covered air defense, barrack defense, fire fighting, battlefield first aid and unexploded ordnance clearance under an assumed background that “terrorists” fire rocket shells against and charge at the Chinese peacekeeping force's barracks.